Well-respected source says Security Cabinet caves to world pressure in run-up to Ramadan, will only focus on search-and-rescue op. The Security Cabinet may have decided Tuesday afternoon to end the wider campaign to eradicate Hamas, IDF Radio reported Tuesday, and only focus on the search and rescue for kidnapped teens Naftali Frenkel (16), Eyal Yifrah (19), and Gilad Sha'ar (16). The decision was allegedly made on the basis of concerns over the upcoming Islamic holiday of Ramadan, which could cause Palestinian Arab violence to get out of control. Ministers also allegedly noted the waves of international criticism against Israel after the operation, with critics claiming that the raids are interrupting the pace of daily life in the Palestinian Authority (PA). It should be noted while the report is on the front page of the IDF Radio website, no other Israeli media outlet appears to have reported on the decision. Defense Minister Moshe Ya'alon responded to the reports on Tuesday while touring the north, where there has been a recent flare up on the Syrian border after Syrian forces on Sunday killed an Israeli teen in the Golan Heights. 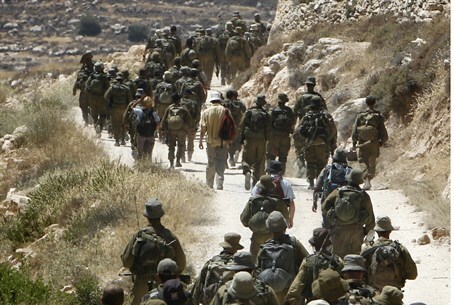 "There are no orders to reduce the level of activities in Judea and Samaria," Ya'alon claimed during the tour. "We are continuing the same intelligence and operational effort to achieve the release of the kidnapped and to put our hands on the kidnappers. That hasn't changed." However, Ya'alon commented that "the activities against Hamas have for the most part been exhausted, but will be continued as long as needed - and it's not only an issue of the orders of the political eschelon." Arutz Sheva spoke to an IDF Spokesperson's Office representative over the issue, who could not confirm the report, but stressed that there are several security bodies at work in Operation Brothers' Keeper, and to her knowledge the operation is still at full force. The report also surfaces just hours after the United Nations Human Rights Council skewered Israel at a meeting to discuss the operation, in a hearing comprised almost entirely of anti-Israel testimonies. Wild accusations made included claims that Israel is occupying both Syria and Lebanon, that Israel imprisons Palestinian children and the elderly, and a pro-Palestinian NGO's claim that Israel has "kidnapped Palestinian mothers" in comments just after the emotional speech of the mother of kidnapped teen Naftali Frenkel. Hours earlier, a senior IDF official stated to Arutz Sheva that the operation had progressed - and that not only was Ramadan not an issue, but that daily life in the PA was being preserved as much as possible despite the raids. "It is important for us to maintain routine for Palestinians [in communities IDF is searching -ed.] and not deteriorate the situation," the official said. He also deflected concerns that Ramadan would hinder the operation. "Ramadan is not a wall [for us] and we will continue to do whatever is necessary to find [the boys]."